Click on any image or button to view works by our featured artists. Private dealer specializing in Non-Mainstream Art, Outsider Art, Artbrut Art, Self-Taught Art, and the Art of Trauma. 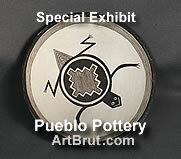 Also Vernacular Art, Neuve Invention, Visionary, Folk and Contemporary Art, Photography, Pueblo pottery and Found Art and Oddities. Museum quality paintings, sculpture, and collage, including work in oil, acrylic, ink, and recycled materials by emerging artists as well as masters. Very strong, sometimes confrontational work, illustrated through over 400 images and thoughtful text by both the psychiatric and art communities. The gallery is open by appointment or by chance and there are several Open Houses a year, including the popular Sculpture in the Garden Show held each Spring. Welcome to the website, come visit the gallery and enjoy! "The critic Roger Cardinal has described several characteristics of outsider art that make a certain sense-even while they seem applicable to all kinds of artists. He has written that outsider artists are isolated or secretive individuals whose work creates an alternate world, which is obsessive and illogical and is often made from commmonplace materials. But, many people in the field, especially museum professionals, increasingly consider this definition to be slightly pejorative or to isolate such work from 'normal' art in ways that either diminish or idealize it. In addition, so much of this art is entering the mainstream of both art history and the art market that the word is not only confusing but inaccurate. The question about the word 'outsider' isn't going to be settled here, but it seems indisputable that as this work becomes more familiar and is more carefully considered the blurring of boundaries will continue. Because the bottom line is this: what makes outsider art memorable is not its outsider origins, but a level of artistry and power that withstands comparison with any other kind of art." All images and paintings copyright of the artist.